Märta Bucht was a teacher and a driving force for women’s issues, the temperance movement, and children’s welfare in Luleå. Märta Bucht was born in Luleå in 1882. She was the daughter of cartographer Wilhelm Bucht and his wife Rosa. Her father was a town surveyor for Luleå who is best known for his role in implementing the new town plan following the great fire of 1887. Märta Bucht’s paternal grandfather, sheriff Lars Johan Bucht, had a less-glowing reputation given that he was one of two officials to be killed at the 1852 riot in Kautokeino. The Bucht family included six children. Märta Bucht and her sister Agnes were educated at Luleå Elementartläroverk för flickor, a private primary school for girls, which had been founded by Elina Benckert and Ester Lönnegren. After completing her schooling Märta Bucht moved to the mining community of Malmberget, where she spent a few years working as a governess, all the while dreaming of becoming a teacher. Following her father’s death in 1894 the family fell into financial difficulties. At that point Elina Benckert, Märta’s former principal, stepped in and funded her further education. Through this funding Märta Bucht could study at Privata högre lärarinneseminariet (private advanced teacher training programme) in Stockholm from 1901 to 1903. While she was in Stockholm Märta Bucht was heavily influenced by Matilda Widegren, a pedagogue and peace activist whom she shared accommodation with while studying. Märta Bucht returned to Luleå in order to take up a position as substitute teacher at the girls’ school, and she then got a post at Statens normalskola för flickor (a state school for girls) in Stockholm. She worked there for several years before she once again returned to Luleå and took on a permanent post at the girls’ school college in 1907. Märta Bucht taught Swedish, German, geography, and singing lessons, but was particularly fond of modern literature. She has been described as a lively and engaging teaching who retained her youthful outlook and involvement which went far beyond the four walls of the classroom. Märta Bucht actively participated in school celebrations, theatrical performances, and particularly in various associations. The door to the Bucht household was always open for discussions, singing, reading, and socialising. When the girls’ school transferred into municipal ownership in 1933 Märta Bucht became its deputy director. She continued teaching at the school until she retired in 1948, and even then she carried on working as a substitute teacher for several years. Märta Bucht was a driving force whose idealism and political efforts went hand in hand with her career. The Luleå branch of Föreningen för kvinnans politiska rösträtt (FKPR, women’s suffrage association) was established in 1907 with Anna Gustafson, a local dairymaid, at the head of the interim board. Märta Bucht became the association’s permanent chair from 1908, a post she retained until the association disbanded. The Luleå suffragettes were active and participated at the national level; they travelled to national meetings, invited known speakers to Luleå, and undertook educational activities for themselves and for others. Märta Bucht’s private correspondence includes letters from Frigga Carlberg, amongst others, testifying to her contacts within the national network. Her friendship with Matilda Widegren was important for Märta Bucht. They were both very active in the peace movement which arose out of the suffering caused by the First World War. In 1915 an international women’s conference was held in The Hague in order to discuss peace. This conference was the beginning of a federation which was formalised in Zürich in 1919 as the Women's International League for Peace and Freedom. Märta Bucht was one of twelve Swedes in Zürich. She was a member of the Swedish central board and chair of the Luleå branch for 40 years. Another major element in Märta Bucht’s non-profit activities in Luleå was the temperance movement. The local branch of Vita Bandet (white ribbon) was founded in 1902, in a meeting room at the girls’ school, and named Luleå kvinnliga nykterhetsförening (Luleå women’s temperance association). When Märta Bucht returned to Luleå from her period of studying in Stockholm she immediately joined the association, in which she remained a member for the rest of her life. She was also a member of the IOGT-lodge Norrbottens Banér. However, she was most active in Sveriges studerande ungdoms helnykterhetsförbund (SSUH, Swedish students’ temperance association). Rimfrost, the SSUH association at the girls’ school, was set up in 1904 and Märta Bucht served as a constant support in their efforts. Märta Bucht was a local district commissioner and chair of the garden allotment authority. The association opened a children’s summer camp in 1921 for children from homes with tuberculosis. In 1930 the summer camp was moved to Måttsund and the work carried on there until 1955. Märta Bucht made significant contributions to the running and financing of the children’s summer camp. Whilst her colleagues at the girls’ school, Siri Holm and Anna Svensson, became municipal representatives early on in Luleå, Märta Bucht opted to take a slightly different route for her public role. 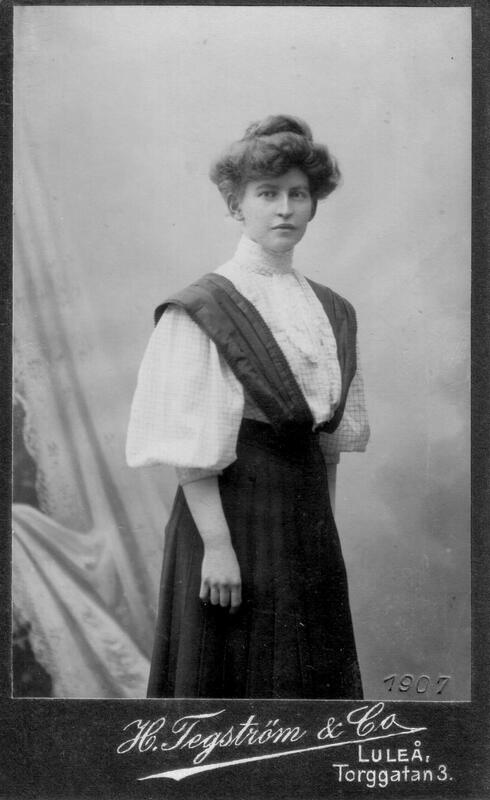 In 1911, just as Siri Holm was elected as the first female town councillor, Märta Bucht became a substitute member of the public school board, in which she remained a member until 1951. She was also a substitute member of the town’s temperance authority and finally a representative on the town council from 1931 to 1934. Märta Bucht also served as child welfare councillor and performed several tasks within the county council. Märta Bucht’s political leanings were liberal, and she was heavily involved in the liberal party (known as Folkpartiet from 1934). She was the chair of the liberal women’s club in Luleå and active in the party’s constituency association, serving on the board for many years. Märta Bucht’s contributions to the education authority were not limited to her professional career. She was a popular educator who played an active role in lecture groups both in Luleå and Norrbotten. She was a talented speaker. In addition to the temperance movement, politics, and peace Märta Bucht spoke lovingly of her old Luleå. Anna Svensson, the principal at the girls’ school, wrote these tender words about her friend on Märta Bucht’s 65th birthday: “society needs many such women: clever, kind, brave, and humane”. Märta Bucht was awarded a royal medal and order in recognition of her contributions to society. Märta Bucht died in 1962 in Luleå. She is buried there at the Innerstad cemetery. Märta Johanna Bucht, www.skbl.se/sv/artikel/MartaBucht, Svenskt kvinnobiografiskt lexikon (article by Karin Tjernström), retrieved 2019-04-19.